So what does this have to do with my job? Well, let’s just say that I’ve been using up my “web designer skills group” much too often already, that it drives me nuts sometimes. I thought alternating from actual design and HTML/CSS/PHP coding would be enough, but it’s not. I still get burned out. And that’s not good when you have deadlines to consider. I thought I could a lot time to do some graphic art work during weekends — making computer art just because. After all, I get to allot time to train for my marathon, why not that too, right? But then… That would mean I’ll be in front of the computer all day, all week. It didn’t seem to be the “artistic break” I was aiming for. 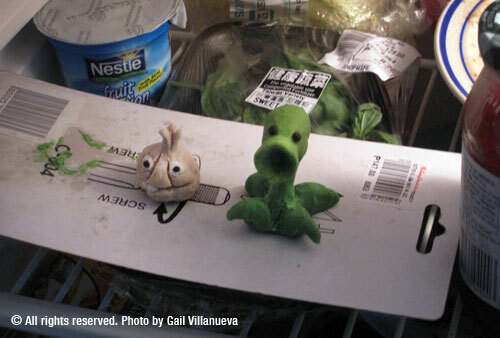 Those are the Peashooter and Garlic from Plants versus Zombies. The creatures are just so adorable in that game! Next time I’ll probably make miniature versions of the things I love… Running shoes, my iMac, basketball — things like that. Clay art as web design “cross-training” has been quite helpful. I’m less prone to burn out since I started, and I look forward to making new stuff whenever I’m not resting or going out with Marc. Work becomes less stressful with these clay creatures. This entry was posted on Friday, 29 October 2010 at 10:48 am and is filed under Arts and Crafts, Daily Dose, Musings, Work. Nice work! Heheh I thought it was about designing a web page. But actually you’ve done a great job on your Clay Art.